This highly effective test preparation guide covers all six domains within the CCSP Body of Knowledge, as established both by CSA and the (ISC)2. 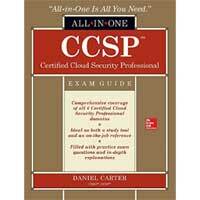 The book offers clear explanations of every subject on the brand-new CCSP exam and features accurate practice questions and real-world examples.Written by a respected computer security expert, CCSP Certified Cloud Security Professional All-in-One Exam Guide is both a powerful study tool and a valuable reference that will serve you long after the test. To aid in self-study, each chapter includes exam tips that highlight key information, a summary that serves as a quick review of salient points, and practice questions that allow you to test your comprehension. Notes, Tips, and Cautions throughout provide insight and call out potentially harmful situations.